This week’s episode of Good Girls Get Rich will surely relate to each and every one of us. Most of us can relate hard times. But be reminded that if you feel beaten down by life and discouraged, what’s more important is you get back up. Today’s guest is Lisa Lieberman Wang. Lisa Lieberman-Wang is a success strategist, breakthrough expert, international keynote speaker and trainer. She is the author of the #1 internationally bestselling book FINE to FAB. She is the co-creator of the cutting-edge neuroscience: Neuro Associative Programming “NAP”. NAP was created for you to be able to heal in a short period of time, avoiding years of therapy with a proven model to breakthrough whatever is weighing you down. 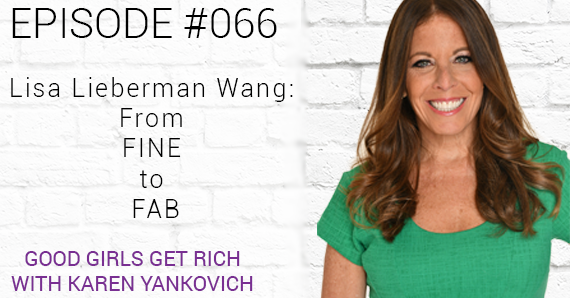 In this episode, Lisa shares the struggles she encountered towards her journey to success and how this inspired her to help thousands of people through her 7 Secrets of FAB. Listen and learn about the importance of self-love and appreciation and the steps to feeling FINE to FAB. Lots of good stuff in this episode! Learn more about Lisa Lieberman-Wang and her works by visiting her website. Listen in to the quick recap below!